This is a great CD, I've listened to it a lot while working & in the car, and I have to say it is fast becoming one of my favorite jazz cds. Getting back to one of my favorite genres...JAZZ! I have to step out of my genre at times (rock, americana etc), and get back into one of my favorites...Jazz! Noah, you guys are great and obviously on the right track. Congratulations on the airplay! And thanks for the tips on sending material to radio stations. Trying to do the same now myself. Regards, King Orba. After growing up in Billings and graduating from Skyview High in 1990, Noah Peterson spent a few years woodshedding his saxophone chops with the Marine Field Band, playing jazz, rock, funk, pop and Latin. Now, he's living in Portland, Ore., and working hard to break into the flourishing and increasingly important Pacific Northwest jazz scene. 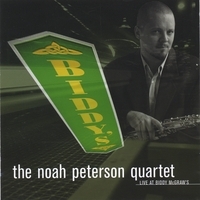 Peterson's first live disc captures a run with his group at Portland's Biddy McGraw's, and they really swing the joint. It's a set of mostly straight-up jazz, with standards such as "Take the A Train" and Miles Davis's "So What." But it gets a nice, hip, modern groove from guitarist Jay Stapleton. Peterson is more of a finesse player like Josh Redman or Scott Hamilton than a fire-breather like Sonny Rollins or Pharaoh Sanders. On cuts such as "Watermelon Man" and "June Bug," Peterson cleverly dodges in and out of the melody and gives the rhythm section plenty of elbowroom before a couple of fearless closing solos that set the Biddy's crowd on fire. Although the session is miked a little funny, making it muddy in parts and hard to understand Peterson's shouts and introductions, what is clear is how this band wins over the crowd, totally owning it before the night's out. I love this CD. It has just the right amount of smooth jazz with a little George Clinton in it. Thanks for sending me a copy of your new CD, I am really enjoying listening to it. I just listened to your CD - WOW! Really impressed. Some great things happening in there. That's a good group you have. Thanks and keep up the good work!! I love the CD. I MUST get a CD player for my car, so I can listen to you. Your label was awesome too. Awesome! A great mixture of sass and funk. Loved it. The music is fresh and has a unique style. The sax playing is great and the sound is really throaty and sweet at the same time. Outstanding guitar. Everything just goes together nicely. Perfect driving music. So good I had to buy two! This CD is so good, I had to buy two of them! Now I can loan one out and still have one for me. Everyone who has listened to it has really liked it, and I'm trying to get a friend of mine to put it on her juke-box here in sunny southern California. Keep up the great work Noah!